The Leica Q is one of our favorite compact cameras... and based on our brief hands on we can already feel that that there is a new love in our life. Yes, the Leica Q2 is expensive – but if you want the absolute in luxury cameras, this is it. It is equally at home as a fully manual street camera, or as an automatic point-and-shoot. And boy does that 47 megapixel sensor deliver! If you have got the money, get your name on the waiting list... as there is going to be a long, long queue for the Leica Q2. Rumors of the Leica Q2 have been circulating for some time – and now it is here for real, sporting its leather-clad magnesium shell. The Leica Q2 goes on sale today, and we had a brief chance to get our hands on this luxury compact camera just ahead of its official launch. The Leica Q has been in our list of best compact cameras for some time, even in spite of its luxury price tag. And it has been there for good reason... our reviewers loved it, and not least for its image quality. And the Q2 is very likely to not only replace the Q in our list when we have been able to do a full field and lab test – it is also going to reset the bar for compact camera performance. The big change to the camera is the sensor. The Q2 boasts a 47.3 megapixel full-frame sensor – offering double the resolution of its predecessor. That makes it one of the highest resolution cameras out there – including professional DSLRs and mirrorless cameras. In fact, we suspect that the sensor in the Leica Q2 is the same as will be found in the Panasonic Lumix S1R, which goes on sale later this month. 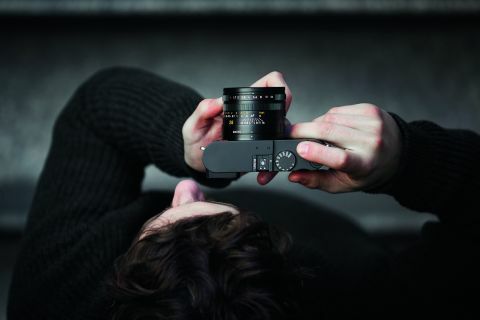 The Leica Q is one of the best selling cameras in Leica's illustrious history. And even after nearly four years on sale, the camera is still back ordered. The Q2 immediately replaces its predecessor, and it is clear that Leica wanted to give a genuine upgrade to the camera without changing the basic concept. A key point is the Summilux 28mm f/1.7 Asph wide-angle lens remains exactly the same. Unusually for a compact this offers full manual focus control, along with distance scales, and a special macro mode. But you can also use this lens in a range of autofocus modes too. In AF or MF, there are a wide range of features to ensure that your target area is in sharp focus. Peak focusing is undoubtedly one of the most useful for this, but there is auto magnification too. And in AF the options include the super-useful face detection mode. Although the lens is fixed – so there is no zoom, and no chance to upgrade your optics - you do get a set of crop options. You can shoot at an effective 35mm, 500mm and 75mm setting – with a corresponding drop in resolution to 30MP, 14.7MP and 6.6MP respectively. You could of course simply crop the image in camera instead - but it is a neat option to have for social media posting, for example. Unlike the Leica Q, the Q2 now offers 4K video shooting. You get a choice of standard 4K format (3840x2160 pixels) – or you can opt for Cinema 4K with a resolution of 4096x2160 pixels). You get a choice of 30fps or 24fps frame rates with 4K, but just 24fps with C4K. Switch down to Full HD, and you get useful slo-mo options of 120fps or 60fps. Another neat addition to the Leica Q2 is that it is now dust and weather protected - conforming to the IP52 standard (which means it can sustain water spray from less than 15 degrees from the vertical). The waterproofing is made more remarkable by that the Q2 now uses the same BP-SCL4 battery as the Leica SL - which you simply push down to remove, without the need to open a protective door. There have been some improvements to the basic shooting specs too... There is a new low ISO setting of 50 (a stop advantage over the Q); the top ISO remains a respectable 50,000. The top mechanical burst mode remains 10fps, but there is now also an electronic shutter option that delivers 20fps. There is a similar boost for shutter speeds too; the mechanical range remains 60secs up to 1/2000sec, but if you want faster speeds the electronic shutter options now go right up to 1/40,000sec (from 1/16,000sec). The closest rival to the Leica Q2 is Sony's RX1R II, which boasts a 42-megapixel full-frame sensor in a compact camera with a fixed 35mm lens. But one big advantage that the Leica has over this is that it has an eyelevel electronic viewfinder, as well as an LCD screen on the back. In fact the EVF is a joy to use, with plenty of detail from its 3.68 million dots. It activates automatically as you put up to your eye. This display has been redesigned from the one found on the Q, and now features an OLED display. The LCD remains a 3-inch 1.04 million dot affair – and this has the distinct advantage of being touch sensitive so that you can control features without the need to dig into menus unnecessarily. One drawback that should be noted, however, is that the screen is fixed – so can not be flipped or angled to help you with bright sunlight, or to each shooting an image from above your head or from ground level. The macro facility allows you to focus manually or with AF, down to 17cm. Autofocus is fast and responsive – and as we have previously said there is a good range of autofocus options to shoot with (including Multi point, One Point, Tracking, Face Detection, Touch AF). But it is the ease with which you can switch to manual (and back) that is the real pleasure. The focus ring simply has an AF position on it, just beyond infinity. As well as this focus ring, and the mechanical aperture ring, there is also the macro ring, which when engaged allows you to focus from 0.17m to 0.3m – although with such a wide lens, you don't get a particularly impressive magnification ratio. Leica has a deserved reputation for beautifully machined cameras, with dials that feel like they have had the hand craftsmanship that gives the company its luxury status. But with this camera, you feel that they have gone much further with this. It is little touches, such as a new diopter correction dial – which you press to pop out, if you need to adjust the EVF to the vagaries of your own eyesight. There is a beautifully crafted button and dial on the top plate, that allows you to switch ISO value (or set to Auto ISO, should you prefer). And the shutter dial is reassuringly made of metal, and there is no sign of skimping on the production values here. The Leica Q2 will, of course, work with the Leica Fotos app that was released last year - allowing you to control the camera remotely, and download DNGs or JPGs to your phone to disseminate to the world. Connection to your handset has been made easier for the Q2, as this now also offers Bluetooth connectivity, as well as WiFi. The Leica Q2 is heavier than its predecessor - thanks no doubt to the new battery - and now weighs in at 718g with the battery (compared to 640g for the Q). But this still feels a very manageable, if meaty, camera in your hands. The good news however is that battery does provide more juice, with the spec sheet offering 350 shots between charges (up from 270). This is not the Leica Monochrom, but with its street credentials the Leica Q2it is easy enough to shoot in mono (and to retain color information in the RAW DNG file). The Leica Q2 goes on sale immediately, and will retail for £4,250 / $4,995. A range of leather cases - in red, tan or black - will be available for the Q2. Other bespoke accessories include an optional thumbrest or handgrip. The original Leica Q will be discontinued. The Leica Q is one of our favorite compact cameras... and based on our brief hands on we can already feel that that the Q2 is a new love in our life. Yes, the Leica Q2 is expensive – but if you want the absolute in luxury cameras, this is it. It is equally at home as a fully manual street camera, or as an automatic point-and-shoot. And boy does that 47 megapixel sensor deliver! Looking at the quick images we shot at the press launch, there is definitely plenty of detail in the files to delve into. If you have got the money, get your name on the waiting list... as there is going to be a long, long queue for the Leica Q2. We, of course, only had a brief time to look at the Q2 ahead of the launch – but hope to be able to update this hands-on test with a full lab report and field test very soon.